That Was Then... Sony Walkman review | What Hi-Fi? This week marks the 36th anniversary of the Sony Walkman, the great grandfather of portable music players. Not only did the Walkman start one of the most recognised product brands in the audio business but it cemented a place for Sony in popular culture. 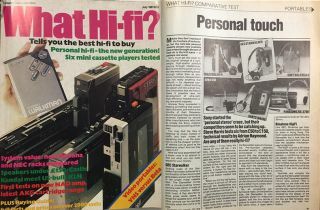 Here we look back at our July 1981 Group Test, where we pitched Sony's second generation player, the £90 Walkman 2, against rival personal cassette players from the likes of Sanyo, Aiwa, Panasonic and Binatone. Although it lost out to the £115 Aiwa S30 for pure sound performance, the Walkman 2 had plenty in its favour, being the smallest, lightest and most portable player of the bunch. We noted that from the front it was "only marginally bigger than a cassette box, and only around twice as thick". It used two HP7 batteries (otherwise known as AA), whereas most of its rivals added to their weight by using three. The small lightweight headphones needed to be "positioned precisely over your ears to get maximum bass response", but "the clear treble quality and openness was something of a revelation". Over the years we've seen the Walkman brand migrate to portable CD players, high-resolution music players and even mobile phones, all with varying degrees of success. Who knows how the brand name will be used in another 30 years time? But if we're talking iconic hi-fi products of the 20th Century, then the Walkman personal cassette player has to be on the list.